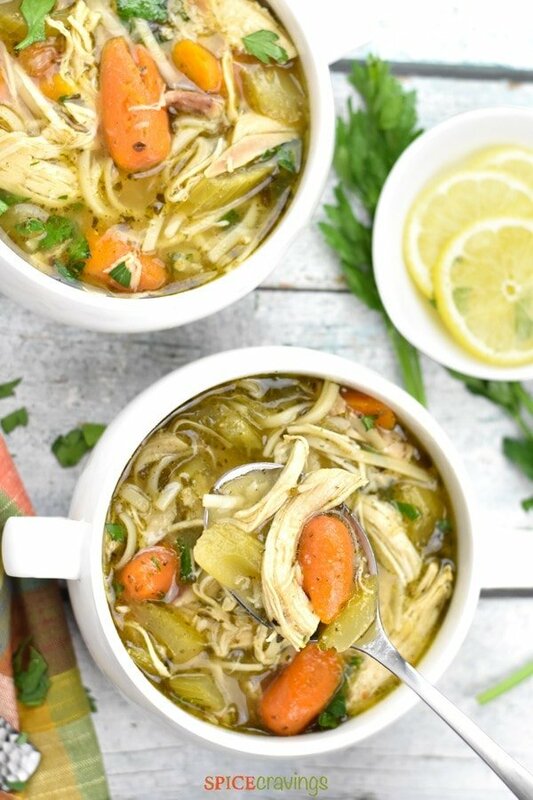 This delicious and comforting chicken soup is the easiest, quickest, and best homemade Chicken Noodle Soup I have ever made using my pressure cooker, Instant Pot! You know a soup is awesome when it feels like a warm hug! 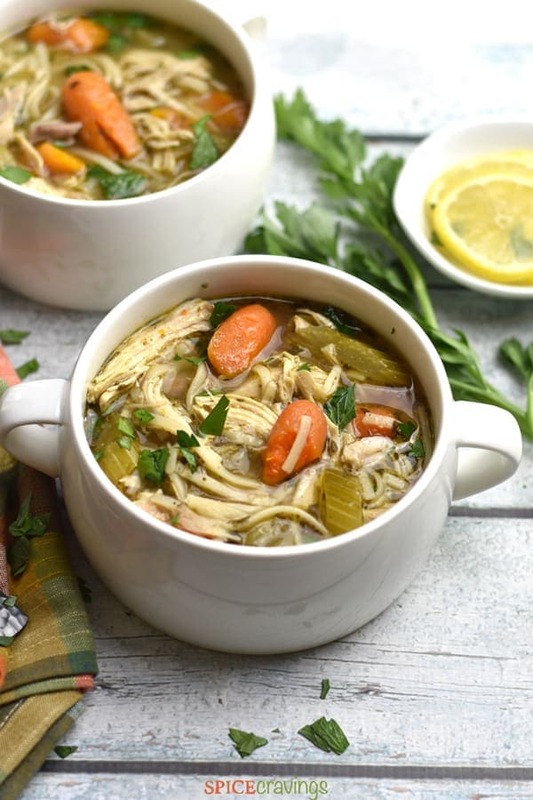 With an earthy broth flavored with aromatics, herbs and seasoning, fall-apart tender chicken, hearty vegetables and gluten-free noodles, this is the ultimate homemade Chicken Noodle Soup made from scratch! Chicken Noodle Soup is one of my all-time favorites. I still remember, when I was a new mom, I used to make this twice a week, it felt so comforting to me. Maybe that’s why my kids love it so much 🙂 . I just wish I had thought of pressure cooking it that time, it would have saved me a lot of precious time. You guys know how much I love to pressure cook, but there are a few recipes that I will never ever make any other way. 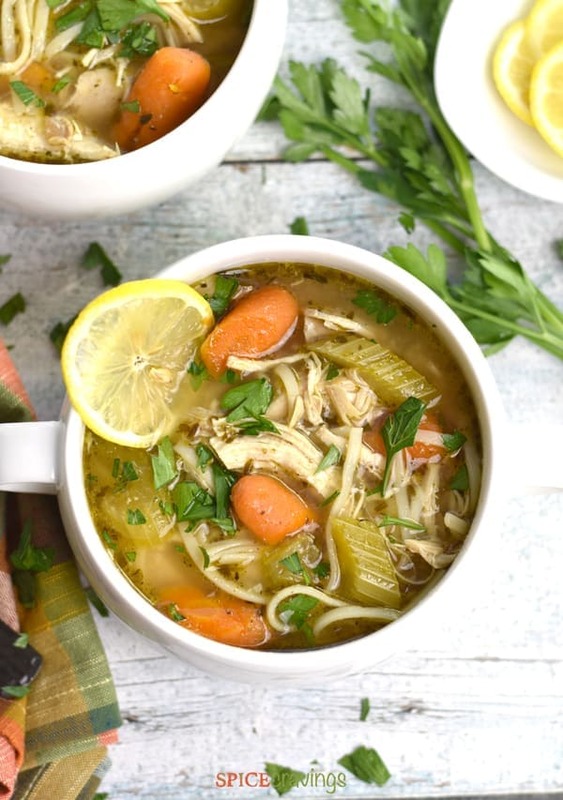 This quick, easy, and healthy homemade Chicken Noodle Soup is one of my best soup recipes. 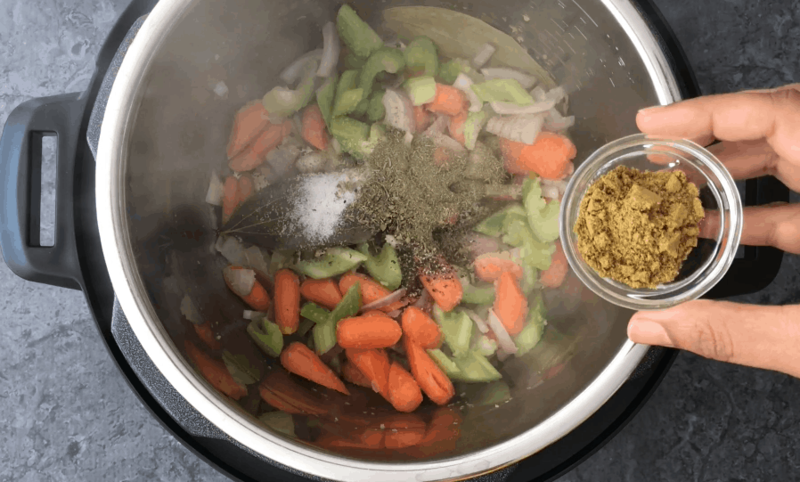 You’ll be amazed what 10 minutes of pressure cooking time does to this soup. The broth becomes infused with all the herbs and aromatics, creating a delicious flavor foundation for this soup. I start by using bone-in chicken, which I think is quintessential in this recipe. The flavor depth that bone-in chicken provides is hard to achieve with boneless meat. I remove the skin from the chicken pieces as I don’t think it adds much to this soup flavor-wise. But that’s a personal choice. I like to do that to make a lower-calorie chicken soup. My family prefers a mix of white and dark meat in this soup, as it adds a nice balance of flavors. 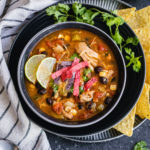 Again, this is a personal preference, so you can add all chicken breast or chicken thighs to this recipe and it will still make a killer soup. Whenever I make Chicken Noodle Soup, I always add extra chicken to the pot. I’ll typically add one extra bone-in chicken breast for later. That makes some delicious shredded chicken for other recipes like Enchiladas, Quesadillas and Chicken Salad Sandwiches. You may find one uncommon spice in my homemade chicken soup recipe, ground coriander! Coriander is a great harmony of earthy and floral flavor tones and that really takes the broth to another level. 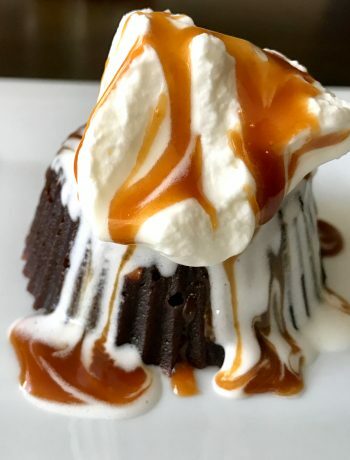 It makes it deeper and richer in taste. 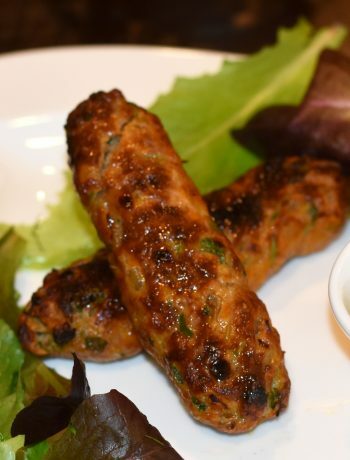 Adding coriander is optional, but I highly recommend it. 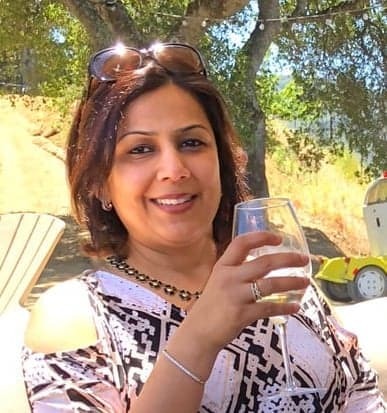 Over the last year, I’ve been experimenting with different varieties of pasta, rice and noodles, mainly to bump up the fiber and whole grains in our diet. I’ve also been working on a lot of gluten-free recipes. Since noodles are a big component of this soup, making it gluten-free was a challenge. I experimented with a few kinds of whole grain pasta and those worked great, but the winning noodle for us was brown rice noodles! I find it in the Asian food aisle in my grocery store, next to the Thai ingredients. It’s a brand called Annie Chun’s Gluten-Free Brown Rice Noodles, and it works great in this recipe. That being said, if you don’t care for gluten-free noodles, you can easily make this soup with your favorite egg noodles and it’ll taste great. 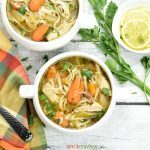 This delicious and comforting soup is the best, easiest, and quickest homemade Chicken Noodle Soup I have ever made using my pressure cooker, Instant Pot! You know a soup is awesome when it feels like a warm hug! Remove chicken skin. This step is a personal preference, you can leave it on if you like. 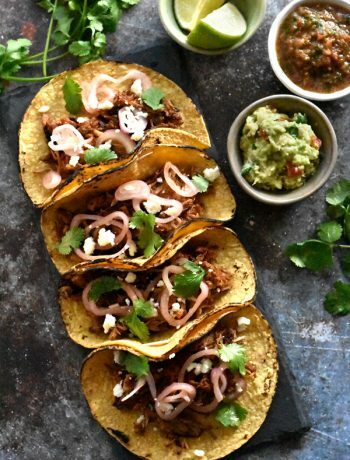 Removing the skin reduces the fat calories in this recipe. Heat oil on SAUTE mode. Add veggies, ginger, garlic and saute for 30 seconds. Turn off saute. This step is optional and can be skipped to make this a Dump & Start Recipe. Add chicken, spices, bay leaves and stock. Close lid and cook on Manual/Pressure Cook or Soup mode for 10 minutes. Wait 5 minutes before releasing pressure. If in a rush, manually release pressure. Place a kitchen towel just in case the soups sprays out a little from the pressure vent. Open lid after the pin drops. Remove chicken and shred it. Turn on Saute. Add noodles and simmer till they are cooked, about 5-6 minutes. Add the shredded chicken back. Squeeze lemon juice and serve warm.